The rise of micro data centers as part of modern data center deployments may seem counterintuitive. After all, many organizations are consolidating large, complex deployments to reduce their data center footprints, reduce costs, and simplify their data center management. Yet, at the same time, organizations are increasingly leveraging micro data centers, to the point where sales are expected to grow from $18 million in 2017 to almost $30 million in 2018, and the global market for micro data centers is expected to grow to $6.3 billion by 2020. Given the rising popularity of micro data centers, it’s important to consider this trend and how it might affect your own data center environments. Let’s look at the key characteristics of micro data centers, a few of the factors driving the micro data center adoption, and the challenges of micro data center monitoring and management. A micro data center (also called a modular or micro-modular data center) is a smaller, self-contained version of a traditional data center. 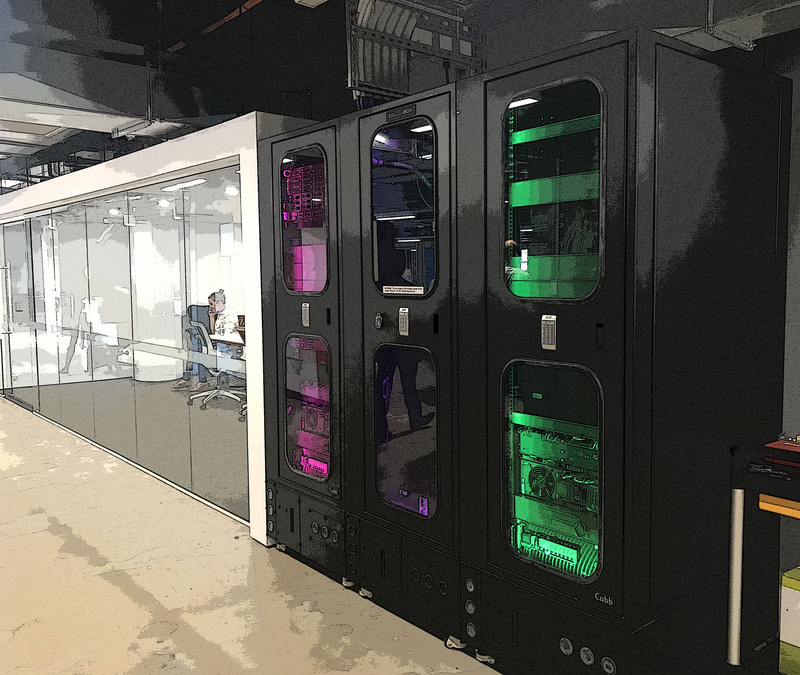 Micro data centers typically have most, if not all, of the same components as their enterprise cousins—such as cooling, power, networking, connectivity, and hardware—packed into a containment unit about the size of a refrigerator. The self-contained nature of micro data centers, combined with their ruggedness, flexibility, and portability, make micro data centers ideal for edge data center deployments. Being contained also helps reduce the risks associated with security, fires, and interference from other electromagnetic devices. As a result, micro data centers can safely and quickly be deployed to remote locations where data center capacity is needed. Micro data centers can be deployed on their own, but they are more often part of a large, planned data center architecture, varying based on need. They might be deployed as a single unit in a small office, warehouse, or even a remote mining site for local data storage and communications, or they could be deployed in sets of multiple units for larger capacities. As micro data centers typically come prefabricated, you can standardize the components before the units are shipped for scalability and to ensure that each unit is exactly the same, reducing the hassle and time needed to deploy. Need to reduce latency and handle large volumes of data. Propelled by the Internet of Things (IoT), big data, machine learning, and other technology trends, more organizations are looking to reduce latency for processing and storage of massive volumes of data at the edge. Organizations also need to decrease the costs of data transmission to serve up content, data, applications, and services to populations in remote areas and smaller cities. Consider the implications of a latency delay on self-driving cars and their ability to instantly process sensor and navigational data. Costs of building out physical infrastructure. Building a new data center, or even converting an existing room to a data center, can require significant time, money, and human resources. Additionally, existing infrastructure can be difficult to update. Thanks to data center virtualization and improvements to hardware, large amounts of dedicated space are not necessarily required for data center infrastructure. Limitations of the cloud. In addition to latency and bandwidth concerns, cybersecurity is one issue that is forcing organizations to rethink their cloud strategies. Many organizations hesitate to put all their data on the cloud and have it subject to potential security threats. Modern data center managers are turning to micro data centers to navigate the complexities of these issues. Lower cost to deploy. Given that they are prefabricated and much smaller than traditional data centers, micro data centers tend to be more cost-effective as well. Faster time to deploy. Micro data centers can be fabricated and shipped quickly, once the components are selected. In contrast, it can take much longer to order hardware and install it—after a traditional physical data center site has been selected or built. Standardization. The components of a micro data center are preselected before the unit is fabricated, so your equipment is always the same. A traditional data center might have a mix of old and new hardware, creating an environment that can be difficult to maintain, upgrade, and scale. Easy to install. Since micro data centers are self-contained, installation is a breeze. As a bonus, they are also easy to move and can be located anywhere from the reception area of a small office to a small room in a hospital or retail store to a remote site out in the wild. Given these benefits, it’s easy to see why micro data centers are a viable and attractive option for data center managers. However, micro data centers come with their own set of data center management challenges. Managing and monitoring micro data centers can be tricky because they are often part of a larger deployment and thus managed remotely. A single deployment can have hundreds or even thousands of micro data centers managed as individual sites. As a result, it can be difficult for a single team to keep track of data center energy consumption and other Key Performance Indicators (KPIs) across all these locations. Accurate data center power management can also be an issue when you have so many sites with multiple intelligent PDUs (iPDUs). That’s where Data Center Infrastructure Management (DCIM) software and other data center monitoring tools can make a difference. A comprehensive data center software solution can help you centrally manage a disparate, remote deployment. For example, it can ensure accurate asset management by tracking your iPDUs by micro data center. Similarly, power and environmental monitoring can be streamlined by having your data center management software collect, store, and analyze data automatically via polling. Remote power actions, such as the ability to power cycle devices remotely, can help you manage and protect your devices during unexpected downtime without having to visit each individual micro data center. Your data center software should also include a health map that provides a holistic view of the health of your deployment, including any warnings or critical alerts. Maintenance is another common concern. Since micro data centers are placed in remote locations, it can be difficult to bring a technician out to the remote site to perform service. Many micro data center vendors avoid this difficulty with plug-and-play components. A new part can be sent to the site, and anyone, even individuals who do not have technical expertise, can install the replacement component. Data center management software can help you with making changes by tracking work orders through a workflow subject to validations and approvals. Tracking the age of your devices in your DCIM software can also help you plan when you need to conduct maintenance to reduce downtime. Despite their small footprint, micro data centers can have a big impact on your data center infrastructure. They can be a fast, cost-effective way for organizations to reduce latency and reach populations in Tier-2 and remote markets, with fewer bandwidth and security concerns than many cloud solutions. The next time you’re planning to build out additional infrastructure or worried about hosting your data in the cloud, consider leveraging micro data centers as part of your deployment. Don’t forget to incorporate DCIM solutions or other data center monitoring software to make it faster and easier to manage your micro data centers. Want to learn more about micro data centers? Check out our case study on micro data centers at the edge with our partner Zellabox, a leader in micro data centers.